You need prompt, expert electrical troubleshooting, repair and installation services at affordable rates and we provide exactly that! We are confident of our ability to meet your needs whether you are completing a tenant build out, repairing existing wiring or replacing electrical fixtures. 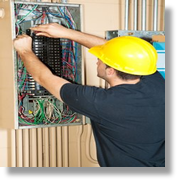 Our Master Electrician won't waste your time or disrupt your business unnecessarily. We offer flexible scheduling to accommodate your business needs and because all work is performed by the Owner/Master Electrician, you are guaranteed to receive the highest quality service in the most trustworthy manner possible. We believe in honesty and integrity and want to provide you with a better experience than you've had with electricians in the past. That's why our Master Electrician will answer all of your questions up front. Our commitment is to provide you with fast electrical services, exceptional results and premier customer service! Before you hire someone to complete electrical work in your business, please take a few minutes to review testimonials from Nisat Electric customers. Also, take a look at our Licensure page for information about electrician licensing regulations in the State of Texas. Our Master Electrician is proud to maintain three licenses including Electrical Contractor, Master Electrician and Journeyman Electrician. Call Nisat Electric at (214) 809-9988 for a competitive bid on your project!